This beautiful pearlised pink handmade card is 127 x 178cm with a deckled edge, and has a subdued background of mocha flowers matted on soft pink mirri card. 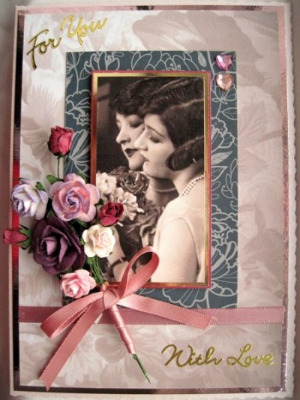 A phototint of a 1920's lady is mounted onto mirri card, then onto a base of grey and taupe peonies. 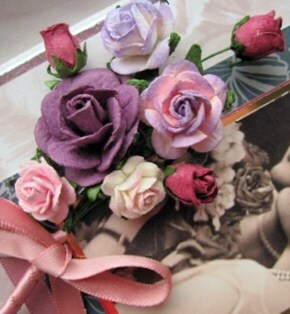 It is adorned with a bouquet of lilac and burgundy paper roses, tied with a pink ribbon, and finished with two pink heart gems. The price includes a tissue-lined box tied with toning ribbon. Postage and packing is free to UK addresses. Please choose a greeting for the paper insert below.